There are two great American gardens that must surely be on everyone's wish list - Fairchild Tropical Gardens in Florida (above) and Filoli in California (below) and I was lucky enough to see both of them in 2010! Both are world famous and serve very different purposes apart from giving pleasure to gardeners - Fairchild is one of the world's great botanical gardens, and Filoli is a landscape garden on a grand scale, so you can't really compare them. And in terms of timing, it wasn't ideal, since Fairchild was recovering from the ravages of a frosty winter (yes, in Florida!) and Filoli was only just coming into bloom. 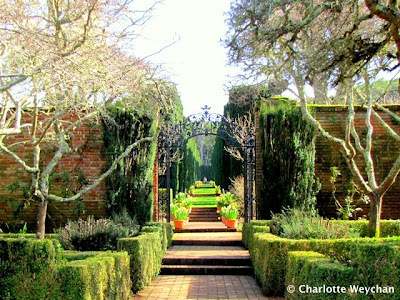 When you read about US gardens, Filoli in California always crops up, so when I finally visited in February this year, it was with a sense of trepidation! Would it live up to my expectations? Would I like it? The answer to both those questions was yes and even though it was so early in the year the gardens looked somewhat bare like sheep after sheering, you could see both the structure and potential of this glorious landscape south of San Francisco. Fairchild on the other hand is like a tree museum with its fantastic collection of palms. Both are must sees if you are in the vicinity. Back in England, my quest for new gardens led me to Feeringbury Manor for the first time this year. 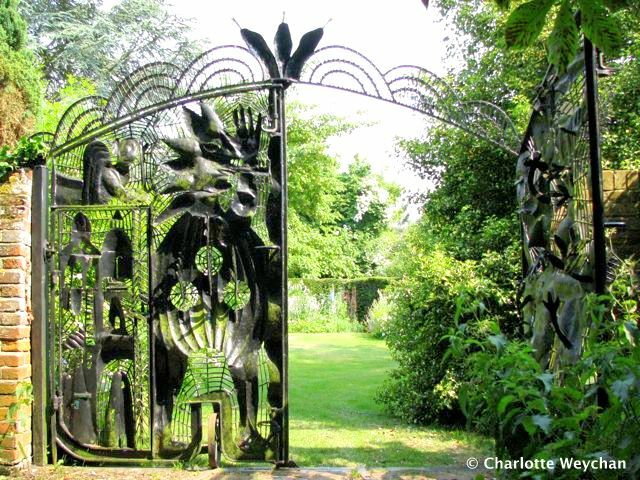 This is an enchanting Essex garden which opens for the NGS and hides behind wonderful sculpted gates (above) - close enough to combine with the Beth Chatto Gardens - but worth making the effort to see anyway. 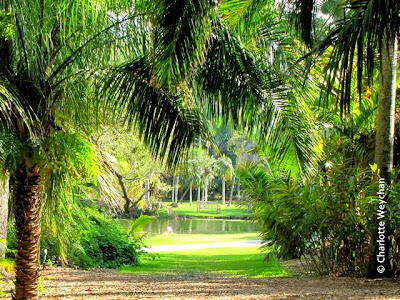 It is a peaceful garden filled with many rare and unusual plants and interesting sculptures. There is an arboretum and several ponds and streams that run down to the River Blackwater. I'm told that the tulips are stunning in May, so this is another one to put on my re-visit list. Another UK garden that flies the flag for the NGS every Wednesday throughout the summer months is Fittleworth House, with its glorious borders and immaculate working walled, kitchen garden. 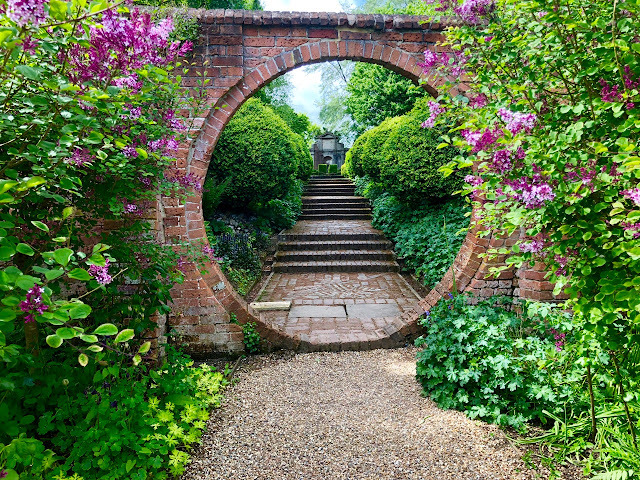 Located in the heart of West Sussex's "cottage" country, you'll see the quintessential English garden here and have the opportunity to sample any one of the local pubs in nearby Petworth (which is filled with wonderful antique shops) or the surrounding countryside. 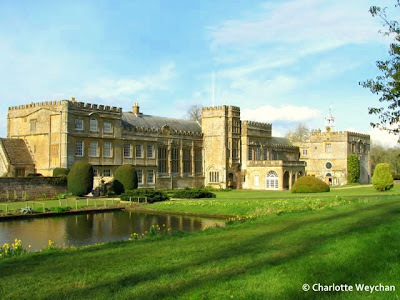 Heading further west, Forde Abbey (above) is one to put on your wish list. 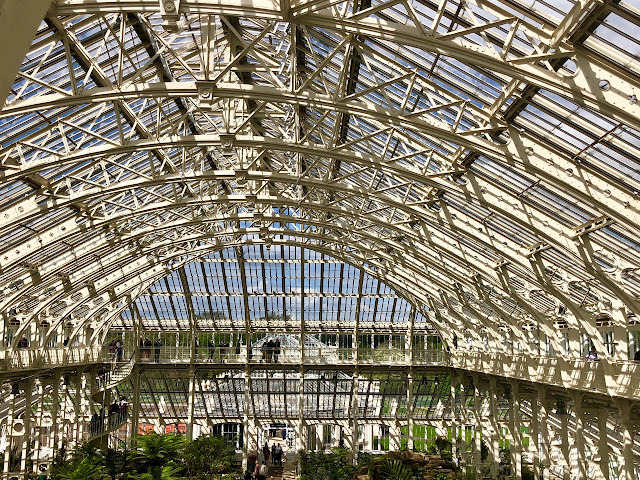 I visited in on a wintery, sunny day in March and was treated to a stunning spring bulb display, but could see that the gardens in bloom would certainly be magnificent. The Abbey is surrounded by acres of open parkland and there are great swathes of woodland and water gardens, as well as a fantastic kitchen garden, a bog garden and a rock garden, plus a magnificent fountain. It seems that I've gone long on the superlatives in this brief description, but I really was very impressed by this property, so must make the effort to return in 2011. 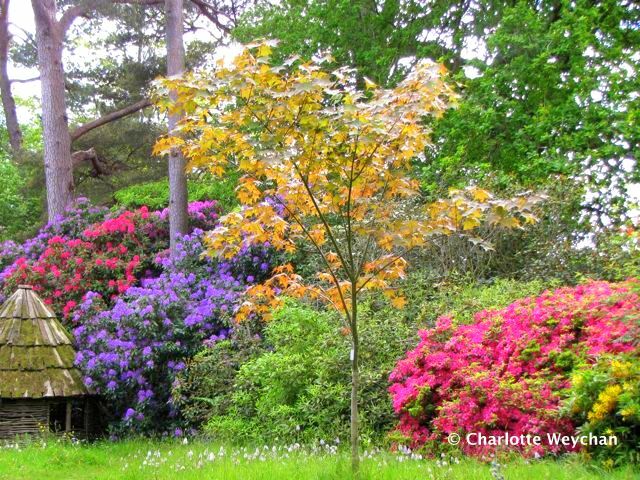 Another charming garden to visit in May when the rhododendrons and azaleas are in bloom is Furzey in Hampshire (above) - you'll find a riot of colour to rival Exbury, but this is a much more personal garden. There are wonderful thatched tree houses and viewing platforms dotted around Furzey which make it a great garden for children. Well worth visiting if you want a wonderful colour display in May and another garden for me to put on my "Must Re-Visit" list for next year. Le bel esprit universel des jardins ! Oh, take me to Fairchild. I want to feel like the picture. Furzey looks like the place for me. Thanks for the tour. I'm with Donna - as the temperatures plummet and the snow flurries start, I'm longing for warmth and green.... Thanks for the glimpses of fabulous places in a warmer time. 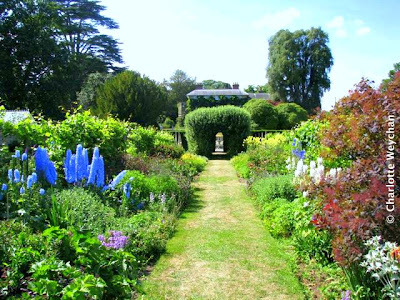 Beautiful garden tours - I just love this series! 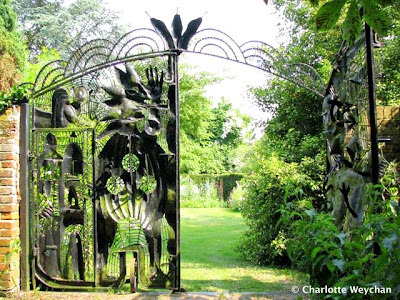 The sculpted gates at Feeringbury Manor are magnificent. Filoli is heavenly--thanks for bringing back some beautiful memories.